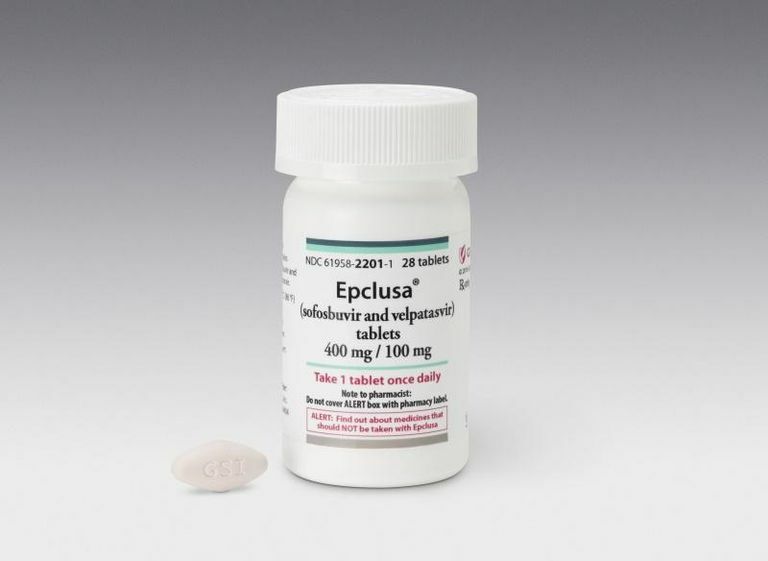 Epclusa (sofosbuvir and velpatasvir) is a fixed-dose combination drug used in the treatment of chronic hepatitis C (HCV) infection. The two drugs that comprise Epclusa work by blocking both an enzyme (RNA polymerase) and a protein (NS5A) vital to the replication of the virus. Epclusa was approved in June, 2016 by the U.S. Food and Drug Administration (FDA) for use in adults 18 years of age and over and is the first direct-acting agent able to treat all six major HCV genotypes. Epclusa is suitable for both previously untreated (treatment-naïve) patients, as well as those with partial or no response to prior HCV therapy (treatment-experienced). Epclusa can be used in persons diagnosed with cirrhosis, although it is recommended that ribavirin is co-administered in cases of decompensated cirrhosis (i.e., where the liver is no longer functioning). Epclusa is reported to have cure rates approaching 100 percent in some groups, while its efficacy in persons with decompensated cirrhosis is said to be as high as 94 percent. Epclusa was released at an average wholesale price of $74,760, or $890 per pill for a 12-week course of treatment. Approximately 75 percent of Americans with HCV have genotype 1, while 20 to 25 percent have genotypes 2 or 3. While only a small number of people in the U.S. is infected with genotypes 4, 5, or 6, they remain the predominant strains in the Middle East, southern Africa, and Asia. In Egypt, the country with the largest HCV population, nearly one in seven people (14.5 percent) is believed to be infected. Among people living with the HIV, the rate of HCV co-infection runs as high as 30 percent in the U.S. and Europe. Globally, the overall burden of HIV/HCV co-infection is around 4-5 million people, or between 10 and 15 percent. Dosage is one tablet (400mg sofosbuvir/100mg velpatasvir) taken daily with or without food. Epclusa tablets are pink diamond-shaped, and film-coated, with "GSI" embossed on one side and "7916" on the other. Epclusa is prescribed over a 12-week course for persons with chronic HCV infection, with or without compensated cirrhosis (in which the liver is still functional). In persons with decompensated cirrhosis, Epclusa is prescribed for a 16-week course in combination with the drug ribavirin. In clinical research, side effects were generally considered low grade with less than 1 percent of participants discontinuing treatment as a result of adverse drug events. In patients with decompensated cirrhosis, anemia and diarrhea are also commonly reported. Clinical research suggested that side effects associated with Epclusa and ribavirin use, while common, were typically mild to moderate, with only 5 percent of participants discontinuing therapy as a result of adverse drug events. The anti-arrhythmia drug Codarone (amiodarone), used to treat irregular heartbeat, is not recommended for use with Epclusa unless deemed medically necessary. The combined use of these drugs can result in a serious slowing of the heart (bradycardia), the effect of which is still not fully understood. If co-administered, cardiac monitoring is strongly recommended. Proton pump inhibitors are generally not recommended for use with Epclusa unless deemed medically necessary. In such case, Epclusa should be taken with food 4 hours in advance of the proton pump inhibitor dose. In persons co-infected with HIV who use the drug tenofovir (found in Truvada, Atripla, Complera, and Stribild), extra care should be taken when prescribing Epclusa. When used together, Epclusa can enhance kidney-related toxicities associated with tenofovir use. Regular renal monitoring is recommended. Antacids (either aluminum- or magnesium-based) should be taken separately 4 hours before or after a Epclusa dose, while H2 receptor inhibitors (a.k.a. H2 blockers) should be taken either simultaneously with Epclusa or 12 hours apart. The dosages of the statin drugs Lipitor (avorvastatin) and Crestor (rovustatin) may need to be reduced if prescribed alongside Epclusa as the pairing of these drugs can increase both the concentration and side effects of the cholesterol-lowering medications. While there is no contraindication for the use of Epclusa in pregnancy, little human clinical data is available. However animal studies into the use of both sofosbuvir and velpatasvir have shown no effect on fetal development. Specialist consultation is recommended during pregnancy to assess the urgency of Epclusa therapy, specifically whether to start immediately or to wait until after delivery. It is recommended that all women of child-bearing age be monitored monthly for pregnancy during the course of therapy. It is also recommended that both the woman and her male partner be provided at least two non-hormonal methods of contraception and that they be used during the course of therapy and for six months after. Mohamoud, D.; Mumtaz, G.; Riome, S.; et al. "The epidemiology of hepatitis C virus in Egypt: a systematic review and data synthesis." BMC Infectious Diseases. 2013; 13(288): DOI 10.1186/1461-2334-13-288.